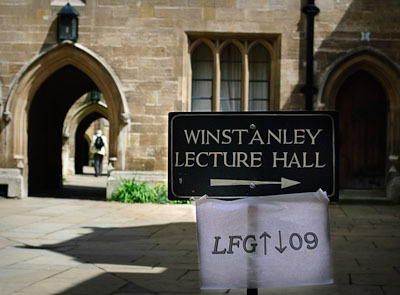 This is a collection of photographs from the LFG09 conference, which took place at Trinity College, Cambridge, during 13-16 July 2009. The pictures have been grouped into galleries by day, with a separate "social" gallery for the pre-conference activities and conference dinner. Enter a gallery by choosing a link from below. Once in a gallery, click on a thumbnail to see a larger image; click on the image again (or the "index" link above the picture) to return to the thumbnails. You can change gallery using the links at the top of any thumbnails page. These photographs were mostly taken by Alastair Appleton, with additional pictures from Anna Kibort, Ron Kaplan and George Walkden. Tania Strahan also has some nice pictures on her Picasa page. These images have been resized for the internet. However, if you would like an original copy of any photo(s), please just e-mail Alastair Appleton with a note of the file number that appears below the photo. Site created and maintained by Alastair Appleton.